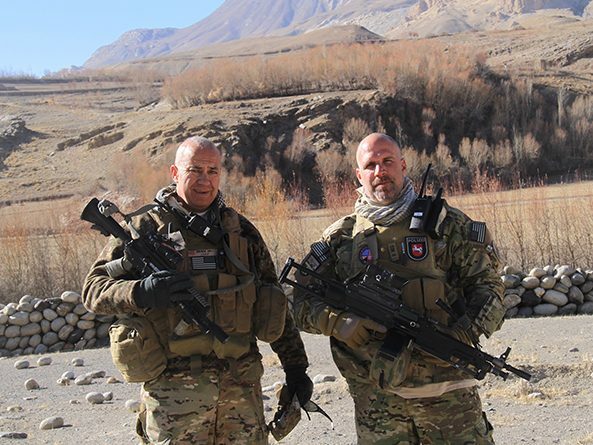 Above: Sen. Tom Brewer (left) and fellow soldier Erik Herring serving in northern Afghanistan in 2011. After spending 36 years in uniform, and being twice wounded in combat, Sen. Tom Brewer said it would have been easy for him to retire and take life easy. Instead, he chose to run for the Nebraska Legislature. “Sometimes you have a fire in your gut to serve,” he said. Brewer’s military service began when he enlisted in the Army National Guard while still in high school. It ended when he suffered serious wounds from a rocket-propelled grenade attack while deployed on his sixth tour of duty in Afghanistan in 2011. Two years and multiple surgeries later, he joined Montana-based Horses and Heroes, leading wounded veterans on horse pack trips that teach teamwork and perseverance. Brewer, who has ridden horses since he was a boy, said the summer rides helped him feel normal again and that he still could contribute to society. Brewer said serving in the Army, which emphasizes keeping an open mind and getting along with others, was good preparation for serving as a senator. In many ways, he said, working in the Unicameral is not much different from being a soldier: political affiliation matters little if you want to accomplish the mission. Brewer said he is still getting used to the job’s pace, which is faster than he expected. “I don’t think when you’re running you really have an appreciation for how much work it is,” he said. He spends Saturdays in his Capitol office, catching up on mail and preparing for the coming week. Brewer said he has enjoyed meeting the other senators and legislative staff. When he has free time, he enjoys riding horses on his ranch in Gordon. A gifted marksman — he coached the 1996 U.S. Olympic shooting team — he also enjoys gunsmithing and competitive shooting. Brewer also participates with several programs that help wounded veterans. Brewer, who flew attack helicopters in the 1980s, also mentors his daughter Kalee, who is training to fly helicopters in the army. His son Travis is a teacher in Omaha and serves in the Army National Guard. His wife Kelli retired from the military after 26 years. An Oglala Sioux who grew up near the Pine Ridge Indian Reservation, Brewer is the first Native American to serve as a Nebraska state senator.